Is Infolinks Good For Your Blog? Lately, I have been searching for better ways to monetize my website. I am a user of Adsense and BuySellAds. Yet, what I have discovered is a new form of advertising: in-text. In-text advertising is a form of online advertisement where the adverts are in built into text or keywords on your blog’s content. For example, a link such as to this article is an internal link. However, if used with programs such as Infolinks or Kontera, it is a form of in-text advertising where each click you get from an in-text ad will result in you earning a little bit of money. The thing I want to know is if Infolinks and in-text advertising is actually worth using and is good for your blog? It is clear that with more people getting banned from Adsense for ‘click fraud‘, people are looking for alternative forms of advertising for their blog. Before you enter the market of in-text advertising, here is my experience of what I think of the niche and the effect it is having on your blog. Although this is common with advertising as adverts are external links, due to Infolinks CTR being a lot higher than most of advertising platforms, the amount of people clicking away from your site due to in text advertising will make your blog have a high bounce rate. It makes sense. If your readers clicked on links in articles to go to another high quality article and they end up going to some random page due to advertisement they didn’t know about, they will lose the trust they have with you (which is bad!). As well as that, they will not click on any future links in articles because they think every link will be a hidden form of advertisement. This can even move people away from your blog! As you can tell from the points above, I don’t think Infolinks is healthy for your blog. Well, no form of advertisement is healthy for your blog. However, the benefits of the advertisement being the earnings usually outweigh the negatives. This is not the case for Infolinks. There are few benefits with one being the pathetic earnings. $0.75 in one week when I could easier earn 30 times more than that with Adsense. That’s my opinion on Infolinks and in text advertising. I would be much interested to hear yours too! I have to agree. The CPC for Infolinks makes it near to useless as a way to make money, even if it is accompanied by Adsense. I have heard of many bloggers putting Infolinks and Adsense together making them some serious money. However, I do think Adsense adverts would perform better by themselves than with other advertising platforms. The more adverts on one page, the probability of one of them adverts getting clicked decreases. Hey this is Tammy from Infolinks. I really appreciate your honest look into In-Text Advertising. There are also a few great aspects that I wanted to share. With Infolinks you can completely control how, where and how many In-Text ads appear per page. Also, our publishers find that the combination of AdSense and Infolinks is the best solution for making the best revenues for their site. Please feel free to contact us with any questions – [email protected]. I can see where you come from Tammy. I would definitely say Infolinks by itself is not enough to monetize a website. But, alongside other methods such as Adsense and the results can be good. As far as PPC advertising is concerned, Google Adsense is the king. 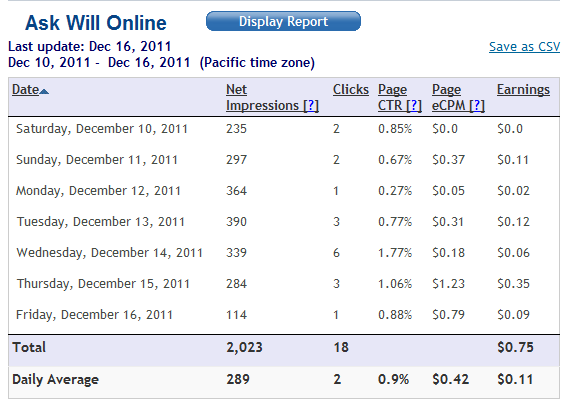 I tried running Infolinks on my other blog but the earnings are not that great compared to Adsense. I want to start to use infolink, but i still dont find Highest Cost Per Click for link. What niche infolink pay better. Is it like adsense? I don know what infolimks pay better for. But, Adsense is FAR better. I would say only use infolimks if you have serious amounts of traffic. I’d like to know which one of these CPC program gives full control of the Ads shown on your website. Actually, I tried Adsense but I’m not rally satisfied with the level of control that it give. You can only block 50/260 categories. To be honest, Adsense gives you more control over adverts than most others. I might be wrong but I don't think Infolinks let's you block any adverts at all. My condition is even more pathetic…I have been using infolinks for 104 days now on my blog (www.siteonn.com) and here are my stats.. So I am going to retire it at the earliest; just waiting for an alternative to infolinks.. I am very experienced with Ads, have been using them on 5 websites for a decade now. Must admit, Infolinks started off badly, however now are just pathetic. I have given them a "Go" on 3 different occasions over 3 years, and each time rushed to remove them. 50 visits and 27 ad views earned 16 cents. The reason I had 50 views is because I had forgotten to remove infolinks so they remained on a single page. 17,821 visits, 1,905 ad views revenue 72 cents. No Joke! At the same time, I earned $82.75 with adsense. Of course, I instantly removed them since Infolinks just being on the site actually reduced my Adsense CTR. No serious site uses Infolinks.